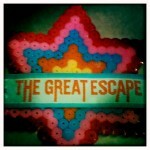 The Great Escape is a new music festival and convention held over three days every May in Brighton. Being a fledgling blog who have also started a record label and soon to release our debut single by Maydays , we were really interested in attending the DIY panel discussions on how to develop and promote a record label in a rapidly changing music industry environment. The other reason to attend was to see some great new bands that we could champion in an unlikely ploy to help attract these bands to come and play in Edinburgh. I do hope The Great Escape sticks to focussing on new bands and stays well clear of putting on a headline act to generate publicity which sadly Edinburgh’s own Haddow Fest did last year by booking Razorlight – paying a band who have no interest in the longevity of the festival a massive fee, which is perhaps one of the reasons the Festival has yet to appear this year, and in the process potentially depriving local bands of the experience of performing in a festival setting. We arrive on the Wednesday evening which is when the Alternative Escape begins. This is a platform for bands who are not on the official festival playlist. We decide to go to the ‘Made In Cornwall’ night upstairs at Mrs Fitzherberts pub, but as we are pretty late in arriving only manage to see the last band of the evening called Holland. Decked out in Cornish flags, upstairs at Mrs Fitzherberts is so small that getting thirty people in is pretty much a sell-out show. On first appearances it looks as if the band members are four feet tall, however the ‘stage’ is actually a two-foot drop from where the audience stands and a wide pillar which blocks the view of the band pretty much means that the singer is facing a wall for most of the set – a bizarrely intimate venue. Holland are not influenced by The Beach Boys despite their name being the title of one of the bands’ great early ‘70’s records. Their music is fast and frenetic combined with dream-like vocals, but clearly they know how to create a dynamic within a song which keeps their slightly shoegaze approach appealing. They are incredibly tight and have a good sense of how to pace their set with current single “Lovely Bones” being a standout track which keeps this small but highly enthusiastic crowd jumping in admiration.